PLEASE NOTE: July 17 performance is canceled due to a death in the family. There are some changes in the lineup for the July 24 and 31 performances. For the performance this coming weekend, Linda Austin will perform on a shared bill with Linda K. Johnson at Headwaters as part of The 1 Festival. Every Sunday in July LINDA AUSTIN dances her way through an idiosyncratic temporal structure in which vast and shifting internal landscapes of past and future weave through the ineluctable slipperiness of the present moment, research towards her fully staged group project A head of time in 2012. 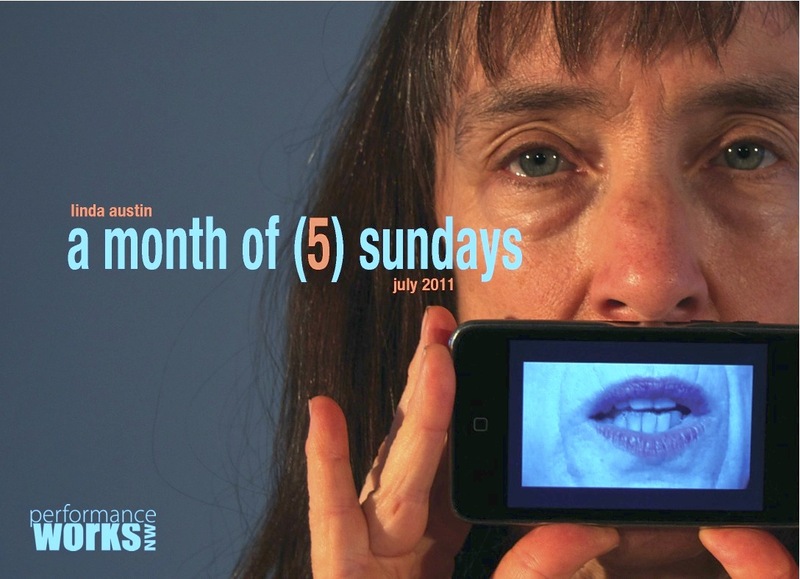 Each Sunday’s solo is accompanied by the ghost of the previous Sunday’s iteration in the form of a floating video projection and is paired with a work by another artist. All proceeds go towards dancer honorariums for the 7 dancers involved in this project.